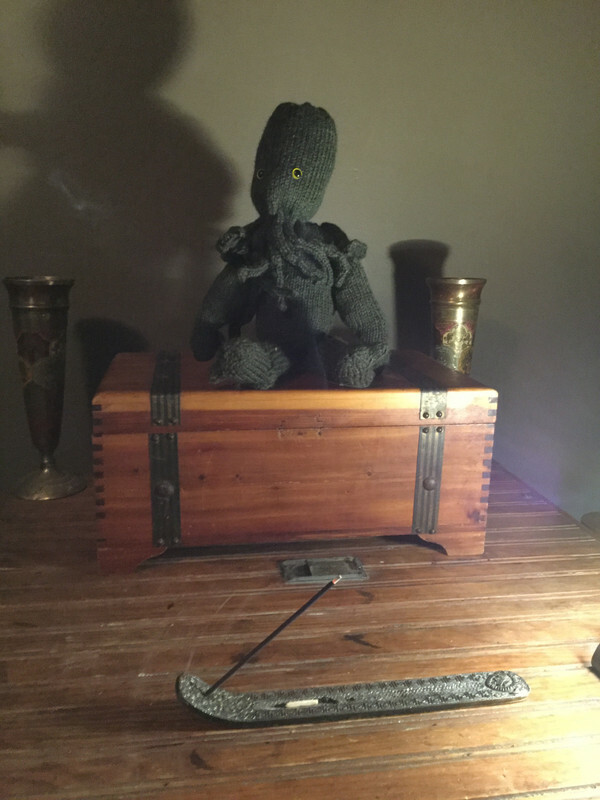 Apologies for my first post in years being something not quite steampunk, but allow me to introduce me newly-aquired early Christmas present, the knitted Great Old One Cthulhu! 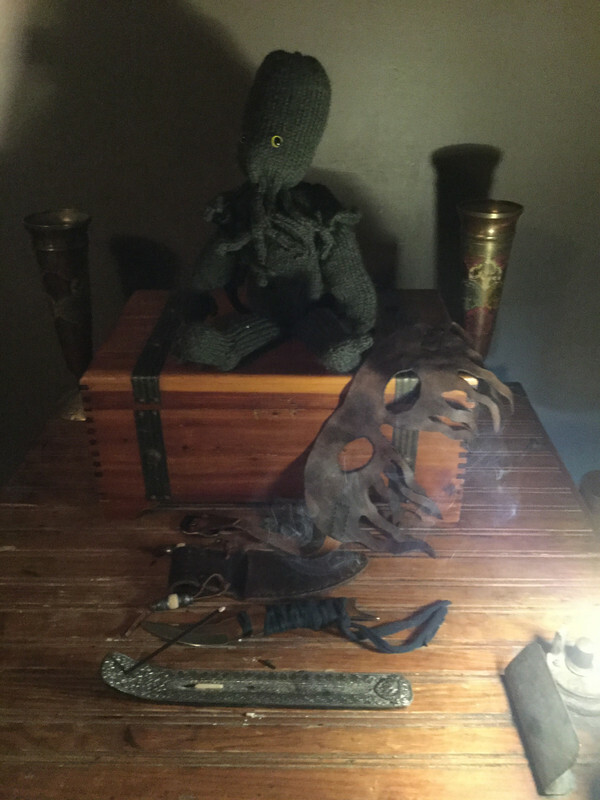 Crafted expertly by my mother, Knitthulhu is accompanied on the altar by a sacrificial dagger in hand-made scabbard marked by the Elder Sign, with several odd dangly beaded bits; a belt pouch emblazoned with a crude likeness of Azathoth, and a leather tentacled mask. 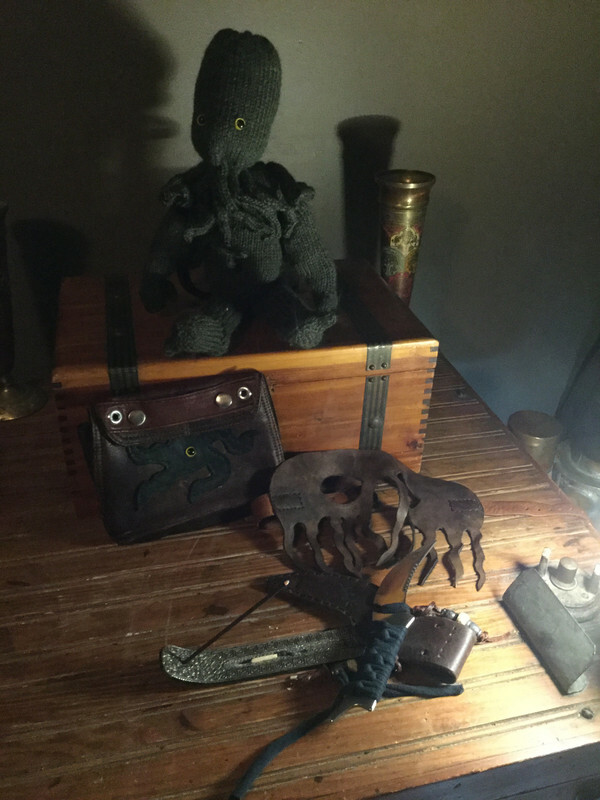 Ah, the jungle Great Old One Cthulhu! Just the right colour for lurking in the shadows of his South American cenote! 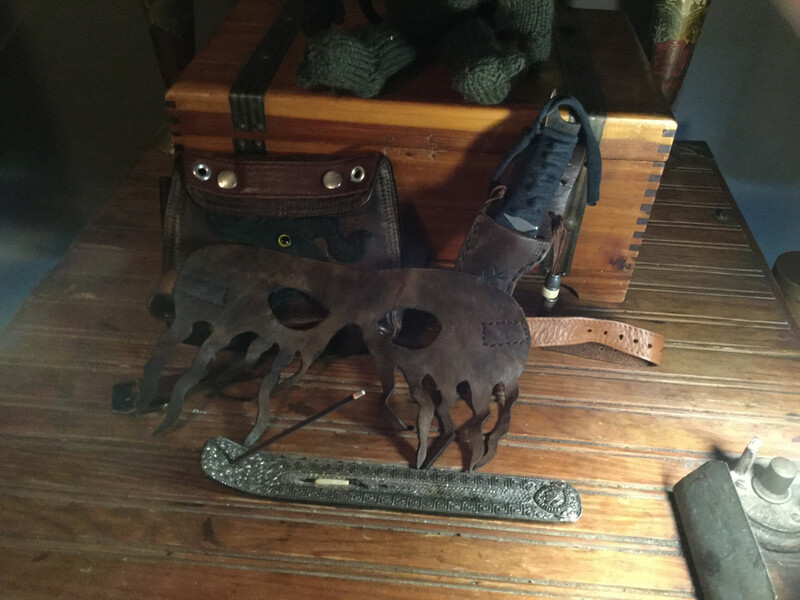 Things of Wonder and Power come from Down Below... I mean to the South. Looks wonderful. 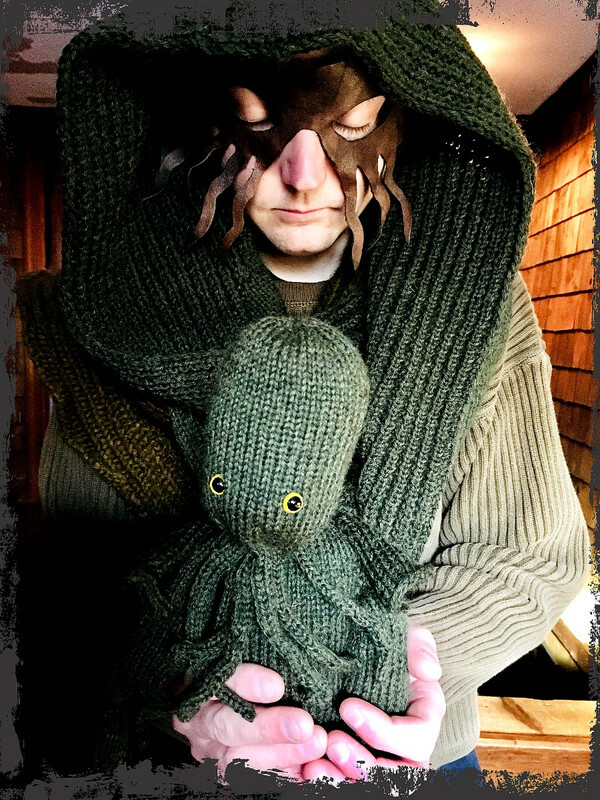 Love Knitthulhu . . . . . There's this song that virtually everyone must be familiar with . . . .'The Lion Sleeps Tonight." "In the jungle, the mighty jungle, the Lion sleeps tonight,"
etc. 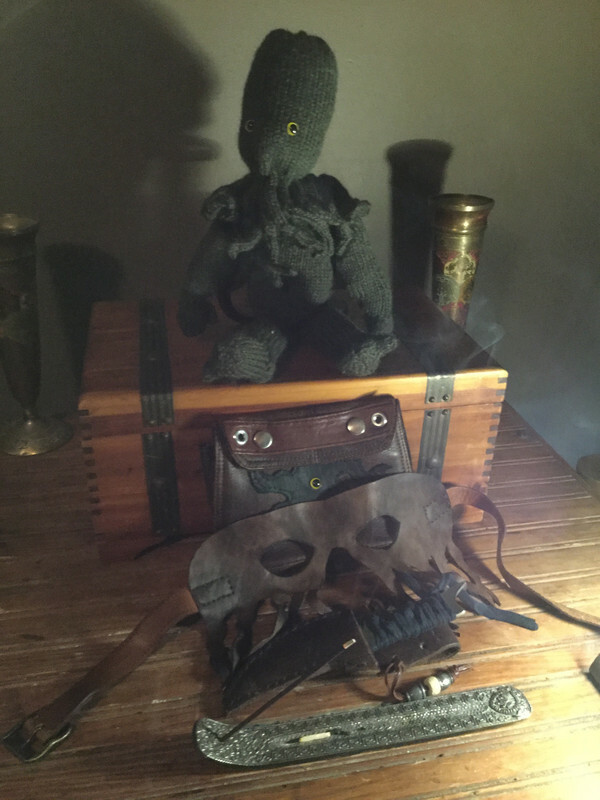 I play mandolin and guitar in several jamming groups, both in Canada and Mexico, wherein this song is commonly sung - virtually every time in fact - and several times I've tried to introduce a variation . . . .
"In the ocean, the mighty ocean, Cthulhu sleeps tonight." - but no-one understood what I was talking about. Such woeful ignorance . . . . Although I suppose the chorus, substituting "Cthulhu Fhtagn, Cthulhu Fhtagn" in place of "Wimoweh" might be hard for mere humans to pronounce. Oh well . . . .
"Truly I say to you, he who seeks, shall find. And quite often, he shall wish he hadn't." 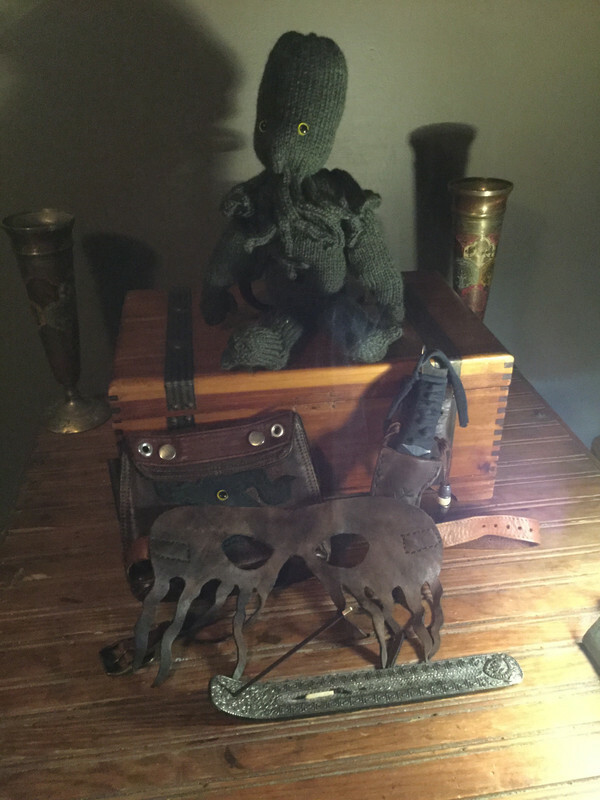 i'm so thrilled my little Knithulhu has gotten so much positive response!